In Germany, one saying for marrying is that you "enter port". 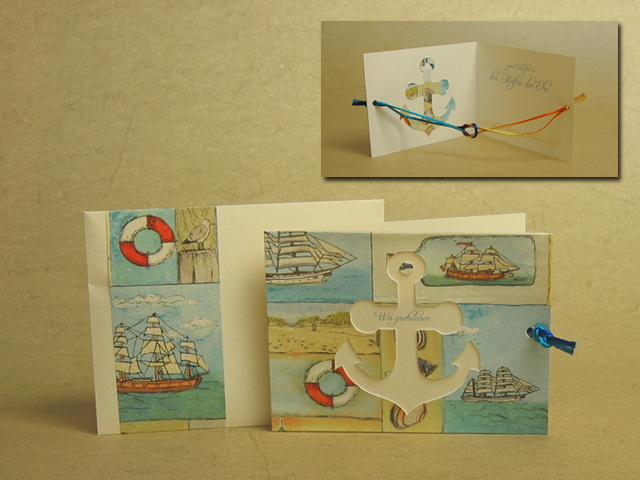 As my brother and his wife-to-be also like to sail, I decided to play with this idea and made a wedding card with a nautical theme (with matching envelope, of course). On opening the card, two strings tie a reef knot. The greeting reads "Wir gratulieren zum Einlaufen in den Hafen der Ehe", which roughly translates to "Congratulations on entering the port of marriage". The greeting is completed with "Seid stets der Wind in des anderen Segeln". This roughly translates to "Always be the wind in each other's sails". It's another German saying, expressing that you give each other strength and support and help the other reach their full potential. To me, that's what a great partnership is all about.